Just before Christmas the 'coven' aka Thursday night mob met at Carol's for some Christmas festivities. We all took some fibre to swap, and I brought home 6oz of alpaca top, overdyed teal and green on naturally coloured tan and chocolate alpaca. It was a little compacted. So this afternoon I suddenly inspired myself to drag out the Hedgehog drumcarder, and stuffed this through with half as much again of a soft white wool I'd handcombed a while ago, and a generous handful of mostly green glitzy stuff. The camera hasn't got the colour at all right, and due to taking it by flash rather than natural I couldn't adjust, but it's somewhere between forest and olive. The white's lightened it a bit, and the sparkle adds lots of interest. I fancy a 3-ply yarn in a dk or thicker weight. Yay! I have just rung the chap I buy my fibre in bulk from, and he has two bumps of the beautiful 19 micron Aussie merino that went so well last year. 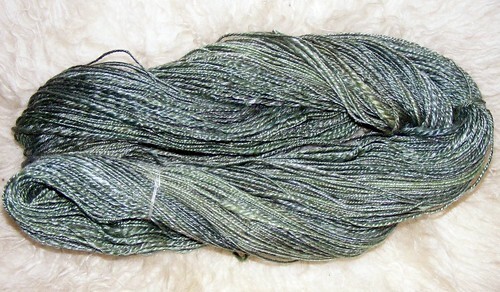 He'll deliver it one evening next week, and I have a handful of 100g balls left to dye before then. This stuff is a dream - dyes beautifully, felts easily (something to be careful of when dyeing but useful if you want it for felt! 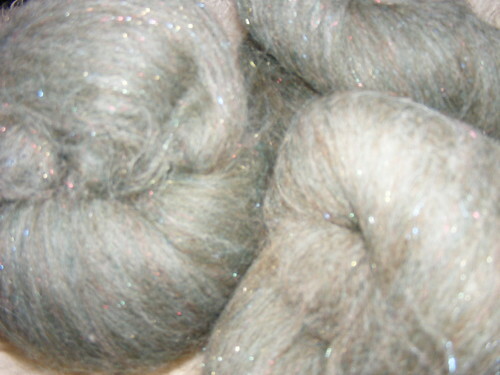 ), and spins like butter provided not felted. As I pride myself not dyeing very careful without felting, this is great. He's also got some superwash merino - not as fine, but very popular with people who like to spin and make babies' machine-washable clothes or socks. This is a bit of a pain to dye - because the superwash treatment makes the fibre GRAB the dye out of the dye solution much quicker, I can't use the already hot water from the previous (exhausted) dye bath and have to heat each bath from fresh. So it uses lots more water and lots more energy. BAh! And he has sparkley stuff too. As I have far too many fleeces at the moment, I think a few will be stuffed in the big dye pots and dyed randomly, and then carded with sparkly stuff. It will be very pretty. Let's hope lots of people buy them. The Etsy shop's more or less wound down at the moment, though I did have a sale yesterday that will be on its way tomorrow morning. The odd colour/fibre may be put up there, but really I have to start seriously stockpiling for Wonderwool at the end of April. With me just bolting on the fibre stuff on to the day job I really can't do enough stuff to keep Etsy busy and have enough for a selling stall. This is the sockyarn I ended up doing my Ravelympic socks in - I just stash-dived and pulled up various colours in most my Sockyarn and some other thinnish dk I've dyed in the past. Rather foolishly, I ended up making them big enough for Mark. This is the first one done at the weekend, and the second's more than halfway through. These are only being knitting on the train to and from work so they're going quickly, considering. Very simple Ramshorn pattern that I've used in the past - three rows plain, three patterned, and two of the latter are the same anyway. 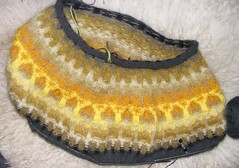 Using different colours too gives an impression of complexity out of all proportion to its ease of knitting. I am enjoying this so much, but really - I bit off far far too much. Which I sort of knew, but dived in anyway. I'm a few inches long than this at the back, but not at the front (short rows) and will probably not even get as far as splitting body and arms before the flame is extinguished. 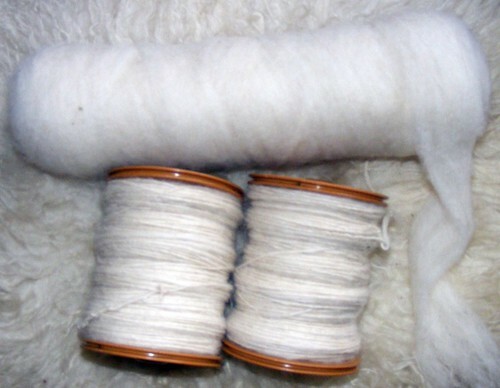 The fabric this gorgeous wool/angora yarn is making is wonderful - light and soft and flexible and yet still structured. The colours are exquisite. Probably finished for Christmas, as there are lots of things I want to start/keep on with once the Olympics are over. 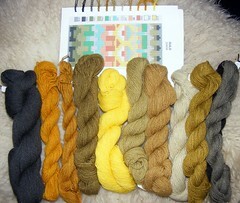 Not least - will start the year's dyeing in March. Which is next week. 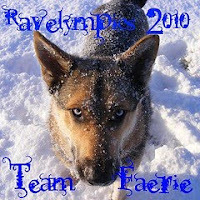 I've left it a bit late, but I've finally set myself a target for the Ravelympics and updated my Ravelry page accordingly. 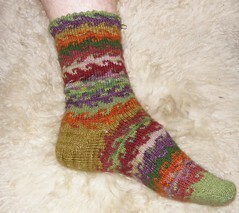 Rather optimistically, I've entered the Gold Bohus sweater kit in the Nordic Colorwork Combined, and as if this wasn't enough, a pair of socks in the Sock Hockey (with fine yarn and small needles, no less). Where this really comes unstuck is that I need to get on with (ie start and finish) the Assassin's Creed costume for Tom, which I should have started before Christmas but it's been too cold upstairs and too crowded since everything was hidden up there for Christmas. As I have now organised space properly up there (and chucked lots of stuff away) there is no excuse not to get the little heater going up there and getting the sewing machine up to speed. I have lots of a creamy twill calico which should work well. Can I knit, sew, watch the Olympics all at the same time? As well as fitting in sculling on a chilly river this afternoon and a head race at Doncaster on Saturday morning (after Friday night's late opening ceremony)? *Checking this post, Lunil's got a particularly beady stare in this photo. Remarkably spooky. After confusion and worry on my part, I've finally been sorted at Woolfest. I had been offered a free stall in exchange for demonstration during the show; I'd taught various workshops at previous Woolfests and was quite happy about this - luckily Mark is a dab hand and looking after my stall. But it turned out that this year the 'free stall' actually meant a table and display board in the non-selling area of the auction mart. Oops! Anyway, now it's all been sorted - the Woolfest organisers have been brilliant - and I have a lovely stall, next door to The Button Lady so we can help each other out, and I can stop worrying. Once again there is a 'Sheep Auction' at Woolfest I believe, and I normally enter something; my sheep hats raised a decent amount of money for charity last year, and I won the prize for the judge's favourite. This of course means that I have something to live up to this time. 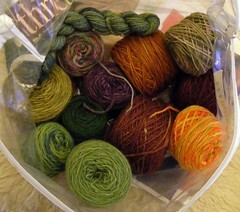 So this yarn is - at the moment - going to make something for this year's 'Fest. Not quite sure what yet, the ideas are still bubbling, but it's Shetland fleece that I had processed into roving a few years ago, spun up semi-long draw into a single which I shall dye and then knit. We'll see. I haven't done any spinning for ages and ages until this came off the wheel last week. It is a merino/tencel blend that I bought from Pete & Carol Leonard (Spindlers2) at last year's Woolfest, on the grounds that it was green. I spun it into a fine, tight single and chain-plyed it. There is more variation of colour and it's darker than it seems. 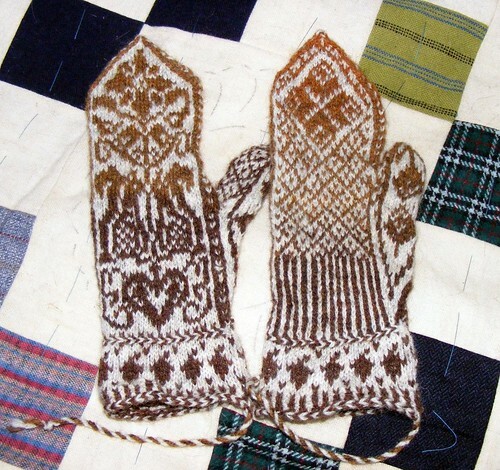 I seem to have a thing about mittens; these are the third pair this winter. Kissing Squirrels - I'm going soft in my ancientness.